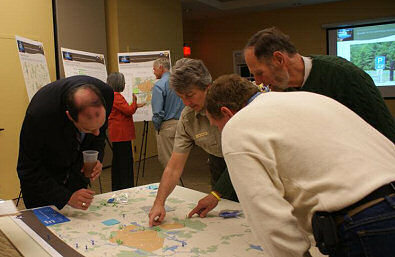 January, 2012: The Assabet River Wildlife Refuge kicked off a transportation study at a workshop at the visitors center in November. Being considered is which of the 3 bicycling allowed refuge roads might be re-paved. Also, possible bike access across the 'south section', connecting to the Mass Central Rail Trail ROW. A follow-up meeting will be held on February 7, 2012. More details on the calendar page. November 9, 2011: The 25% ARRT design plans for Acton-Maynard were delivered to the MassDOT this morning by AECOM, the engineering firm that has the engineering contract. All of the overview sheets are posted on this web site. This comes exactly a year after the design funds were restored in 2010 and AECOM resumed working on the project. 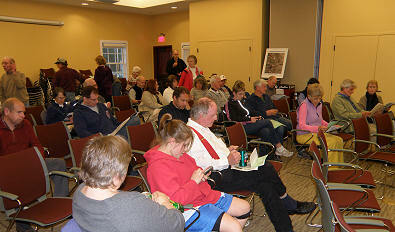 May 5, 2011: A joint meeting of the ARRT, Mass Central and Bruce Freeman rail trail organizations was held at the Assabet River Wildlife Refuge Visitors center.